Quality of Ingredients: (7) While a good idea, nothing was as bursting with flavor as we had expected or would have liked. The meat was definitely tender and had a deep flavor from the SoCo/coffee, but could have used a touch of salt to really bring out those flavors and counteract the sweetness of the SoCo. Winter greens were decidedly a step up from your average bland lettuce topping, nicely complemented by the vinaigrette. The cheese sauce was tasty but not particularly inventive. Our favorite part was probably the salsa fresca, the least creative of the components, but done right. Distribution of Toppings: (7) The cheese sauce was runny enough to coat everything, but the other ingredients were so heavy that they fell off of the chips when you tried to lift them out. Perhaps some real melted cheese would have provided some welcome glue. In the end, we were left with a soupy, saucy mess…that we still dipped our forks into. 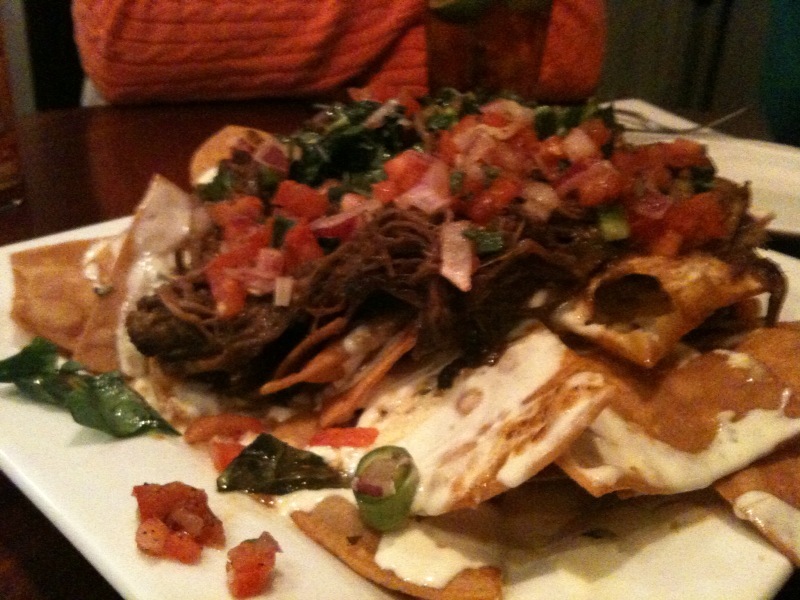 Price: We’re not sure of the market price for wild boar, but it must be up there to justify $14 for these nachos. We won’t be giving them an actual score in this category, because as this is a weekly event and we’d like to be there most weeks, and most nachos will likely cost $14, it’s a bit of a null category. Overall: 23/30. A decent start, but Brian Poe is really going to need to kick it up a notch in the coming weeks. While this was a decent nacho, if you had put it in front of us with no explanation, we might have mistaken it for just a normal pulled pork nacho with fancy lettuce. We want our minds blown, our horizons expanded, our taste buds challenged!